"You must know that I am truly the perpetual and perfect Virgin Mary … I am your merciful Mother … the Mother of all Mankind … Here, I will hear their weeping, their sorrow and will remedy and alleviate their sufferings, necessities and misfortunes …"
On that same morning of Dec. 9, Juan Diego went to Bishop Zumarraga, as commanded by Our Lady, and delivered her message. "I am only a poor man, I am not worthy of being there where you send me. Pardon me, My Queen. I do not want to make your noble heart sad. I do not want to fall into your displeasure." But Our Lady told him that it was he, and no other, whom she wished to send. She commanded him to go back to Bishop Zumarraga the following day. Juan Diego left her, calling her: "My dear one, My Lady…"
The next day, Dec. 10, a Sunday, Juan Diego went again to the Bishop's house and, after much difficulty with the guards, gained admittance. The Bishop questioned him, more impressed this time. But the Bishop explained that Our Lady must provide a SIGN that she really was the Mother of God. Then the Bishop sent two attendants to follow and spy on Juan Diego, but they lost his track. At sunset of Dec. 10, Juan Diego was back on the hill of Tepeyac to report to Our Lady who was already waiting for him. He informed her that the Bishop was asking for a SIGN, (Our Lady, of course, knew what SIGN the Bishop was asking for). This was her THIRD apparition. Our Lady assured him that the next day she would give him the SIGN the Bishop had asked for. After conversing with Our Lady, Juan Diego went home. That evening, upon arrival, he found his uncle, Juan Bernardino, very ill. The next day, Monday, Dec. 11, he cared for his uncle the whole day, missing his appointment with Our Lady and Bishop Zumarraga. Juan Bernardino, thinking he was going to die, told his nephew to fetch a priest the next day for the Last Sacraments. Dec. 12, Tuesday morning, Juan Diego started out and intentionally avoided passing the top of Tepeyac hill out of fear and embarrassment because he had not kept his promise to return there to meet Our Lady the previous day. Also, he did not want to be delayed by Our Lady from fetching a priest since he believed so much in the importance of the Last Sacraments for the dying. But while passing the other side of the hill to avoid Our Lady, Juan Diego was surprised to meet her along his path. This was the FOURTH apparition. "Listen and be sure, my dear son, that I will protect you: do not be frightened or grieved or let your heart be dismayed… Am I not here, who am your Mother, and is not my help a refuge …? Be assured, he is already well … Is there anything else you need?" 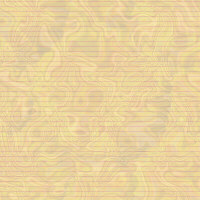 And even as Our Lady spoke she appeared to Juan Bernardino and cured him. Dec. 12. Our Lady then told Juan Diego to climb the hill where only cactuses, thistles and thornbrush grew. Juan Diego had never seen a flower there. But when he reached the top, it was covered with beautiful Castillian roses, wet with dew and of exquisite fragrance. "This is the SIGN that you must take to the Lord Bishop … In my name tell him that with this he will see and recognize my will and that he must do what I ask … he will see that the church is built for which I ask." Dec. 12. Juan Diego arrived at the Bishop's house. He was again kept waiting. The attendants forced Juan Diego to show them what he was keeping in his tilma. But what they saw were mere "printed or embroidered roses." Finally admitted to the Bishop's presence, Juan Diego opened his cloak. The fresh and beautiful roses cascaded to the floor. And behold, a full portrait of Our Lady began to appear on the tilma right before the eyes of the Bishop, as if painted by heavenly hands. In the imprint, Our Lady had her hands joined in prayer, her soft black hair falling gently upon her shoulders under her cape and framing the perfect oval of her face with slightly closed eyes and a light smile. . . a miraculous legacy for all generations to see and know the TRUE FACE of Our Lady. Seeing the SIGN he had asked for, the Castillian roses, and beholding the miraculous imprinting of Our Lady 's image on the tilma before his own eyes, Bishop Zumarraga fell to his knees. Before him was the True Image and form of Our Lady, Her own self-portrait. He wept as he prayed for forgiveness for having doubted her and her messenger, Juan Diego. It seems that when Juan Diego opened his tilma and the roses fell to the floor, Our Lady, who was behind Bishop Zumarraga facing Juan Diego, allowed her image to be imprinted on the tilma as if reflected in a mirror. But She was there as a silent witness to the unfolding event, unseen by all, including Juan Diego. Regaining his composure, the Bishop reverently removed the tilma from Juan Diego and enshrined it in his private chapel. Juan Diego remained with Bishop Zumarraga that evening narrating the events of the past few days. Both were filled with wonder at the things God had wrought in their midst. In two weeks time, an adobe chapel was erected to house the tilma for public veneration. It was dedicated by Bishop Zumarraga on Dec. 26, 1531. From that time on, everybody came to venerate the surprisingly beautiful image...and people have been coming ever since--day and night, season after season, century after century. 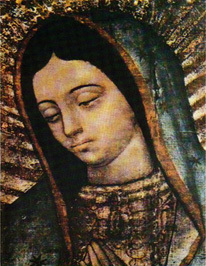 Later, the Church would proclaim Our Lady under the title of Our Lady of Guadalupe, the Patroness of all the Americas. In 1935, Our Lady of Guadalupe was formally proclaimed the Patroness of the Philippine Islands.